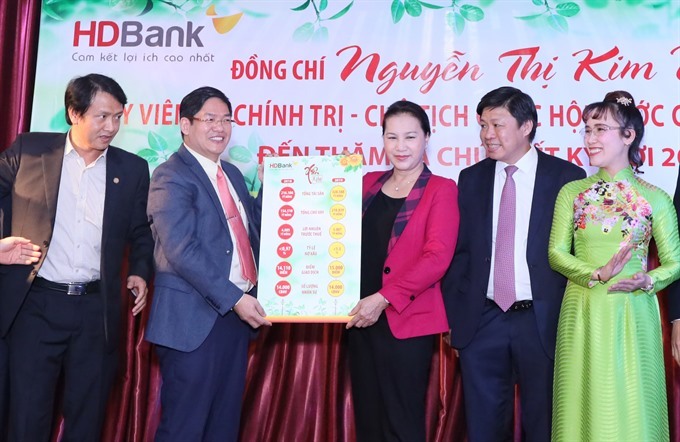 HCM CITY — HDBank and Vietjet can become top businesses not only in the country but also the region and world, National Assembly Chairwoman Nguyễn Thị Kim Ngân said while visiting the two companies on Monday. Speaking during her visits on the first day of work after the Tết (Lunar New Year) holidays, she said she was very impressed by HDBank and Vietjet’s annual reports for 2018. Their combined profit was nearly VNĐ10 trillion (US$430.3 million) and they paid more than VNĐ7.5 trillion in taxes, she said. HDBank has assets of more than VNĐ216 trillion, 285 transaction offices and 14,000 financial transaction points. Vietjet now has 70 aircrafts and flies on more than 100 air routes, two thirds of them international. Nguyễn Thị Phương Thảo, permanent vice chairwoman of HDBank and CEO of Vietjet Air, said the two companies have contributed to the international integration of Việt Nam’s capital and securities markets. Ngân also thanked the foreign employees of the two companies for their contributions to the growth of Việt Nam’s economy.